Sonoran, Great Basin and Mojave deserts of southeastern California, southern Nevada, southwestern Utah and western Arizona. Sandy or rocky desert slopes and canyons between 2,000 and 5,500 feet. Many purple-to-lavender narrow rays surround yellow disks with the overall flowerhead growing up to 2 inches in diameter. 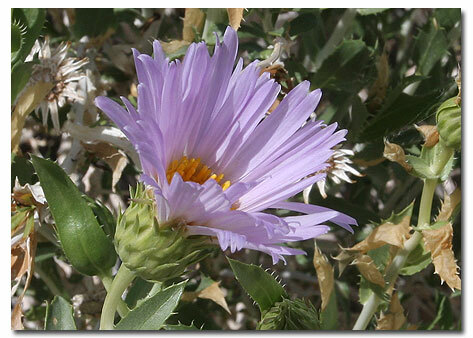 While they usual bloom in spring between March and May, Mojave Aster sometimes flowers in the fall as well. This member of the Sunflower Family (Asteraceae, formerly Compositae) is a shrubby perennial growing up to 30 inches high. It contains many long, gray-green stems with lanceolate, hairy, 3-inch leaves growing from the base. The stems tend to remain leafless near the top. Each plant may bear as many as 20 flowers. After wet winters, it is common to see many black caterpillars with gray and orange stripes on the foliage of the Mojave Aster. These are usually the larvae of the Desert Checkerspot (Charidryras neumoegeni) seeking nectar before transforming into a small orange butterfly interrupted by narrow black lines and spots. 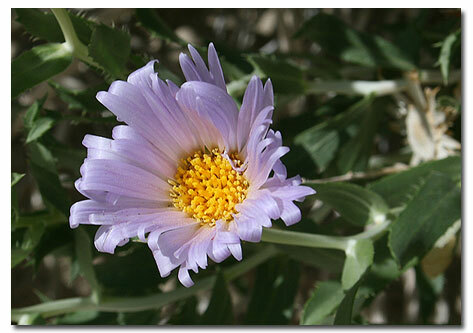 The Mojave Aster is sometimes called the "Mohave Aster" or the "Desert Aster." Its nomenclature is further confused by the fact that many texts give it a taxanomic classicifcation of Machaeranthera tortifolia.. The most recent revision (1996) of The Jepson Manual refers to the Xylorhiza genus as "DESERT-ASTER" and Xylorhiza tortifolia v. tortifolia as the "MOJAVE-ASTER."